Hosalkar HS, Spiegel DA, Davidson RS. Talipes Equinovarus (Clubfoot). In: Kliegman Nelson Textbook of Pediatrics. 19th ed. Philadelphia, 2011:chap 666.3. Beaty JH. 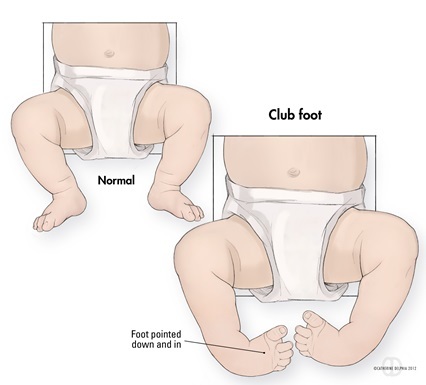 Congenital anomalies of the lower extremity. In: Campbell's Operative Orthopaedics. 11th ed. Philadelphia, Pa: Mosby Elsevier; 2007:chap 26. Cummings RJ. The effectiveness of botulinum A toxin as an adjunct to the treatment of clubfeet by the Ponseti method: a randomized, double blind, placebo controlled study. J Pediatr Orthop. Sep 2009;29(6):564-9.